What’s it Like Having Two Different Publishers? That’s the question I posed to talented author, Marilyn Meredith. She honored me by being the first to host her on a brand new blog tour. Enjoy her comments below. Over the years I’ve had many different publishers for all sorts of reasons. For my Rocky Bluff P.D. series, the first publisher was a pioneer in e-publishing. The problem was no one had a clue what e-publishing meant. Because there were no e-readers at the time, the book had to be read on the computer and didn’t catch on. From there I went to another novice e-publisher, though by that time, print on demand had come along. I switched publishers and had two more books in the series published, but the publisher decided to move on to other pursuits. Of course I found another publisher. My Deputy Tempe Crabtree series had a bit of a different history. The first publisher had four books in the series printed as mass-market paperback. Sadly, she passed away unexpectedly. The next publisher knew all about e-publishing and print-on-demand. Life became a problem, and she gave up her business. It was purchased by Mundania Press who has continued to publish the series. Both my present publishers are savvy about the publishing business, but tackle things in totally different ways. Because I am friends with the publisher of the RBPD series, we discuss both publishing and other topics on a regular basis and even have lunch together now and then. I hire an editor to go over my manuscript before I send it on to the publisher, because she doesn’t have a big staff. I’ve met the former and present owner of Mundania at different conferences. I’m Facebook friends with both. Mundania has a huge stable of authors and professional editors and cover artists on staff. I’m very fond of covers of my books done by one of their artists. My feeling is the biggest difference between the two publishers is the size of the operations. I’m happy with both. 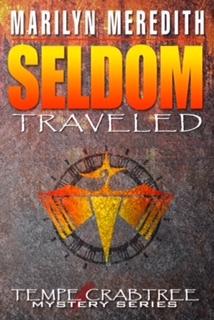 The latest in the Deputy Tempe Crabtree series is Seldom Traveled. Thank you so much for hosting me today, John, as I start my blog tour. Thanks for stopping by, Mark. I’ve lived in Springville since 1981 and my Crabtree ancestors had a land grant where Springville is today. They lost all to taxes. Bear Creek is loosely based on Springville, though I moved it a 1000 feet higher for better trees and interesting weather. Nancy, the publishing biz is strange, and it keeps getting stranger, sometimes it’s hard to keep up. It’s interesting to hear how you’ve managed to work with two different publishers, Marilyn. I always learn from your posts and admire your vast knowledge of writing/publishing so many books. Very nice job! I’m glad to know I’ve been helpful–many authors have helped me along the way too. Interesting, Marilynn. Though I am a dedicated small press author the one problem you note is what I have experienced. Three smaller press companies have closed while I was one of their authors. In one case the publisher and I had a very happy relationship during publication of five of my “To Die For” mystery novels. They did superior editing and promotion and even had one novel in line for a NYT review–cut at the last minute due to influx of major author submissions. Shortly after, the mystery imprint of that press closed. Another publisher who had actually invited me to be one of their authors decided to go subsidy only and I wasn’t willing to do that. Health problems are always a pending problem as well, and after advice from a lawyer, my recent contracts cover that contingency. So be it. But the personal friendships developed with all my publishers continues and I am still in friendly contact with individuals at all companies I have worked with. Oh, Radine, we do have a lot in common. I sure miss seeing you in person. Good, colorful picture of you. Interesting post as always. I’ll see you on my blog next week. Sunday I think. Hi, Linda, always glad to make contact with you. Marilyn, thanks for sharing your publishing history. Looking forward to hosting you in two days. Hi, Maggie, it has not been an easy ride. Looking forward to a good visit. I also learn from your every post Marilyn. Thank you for your tireless contributions to your fellow authors or aspiring authors! Good to hear from you, Joan. So many helped me along the way, it’s important for me to share when I can.